Many patients living with end-stage renal disease (ESRD) undergo hemodialysis treatments – a process in which blood is transported from your body to the artificial kidney or dialyzer for cleaning and then safely returned to your body. The dialysis access is essentially a dialysis patient’s lifeline to treatment and good health. Having a well-functioning access that handles adequate blood flow allows for the most effective dialysis treatment. Knowing what to do on a daily basis to preserve your access and keep it fully functional and when to contact your dialysis care team are important. This download will teach you the basics of access care, how to recognize abnormalities in your access, and when to seek help. You play an important role on your healthcare team and understanding dialysis access care can help alleviate any anxiety you may be feeling. Start with this download to increase your knowledge of how to help keep your access fully functioning. You play an important role on your healthcare team. Become your own expert on dialysis access care and reduce any anxiety you may be feeling. 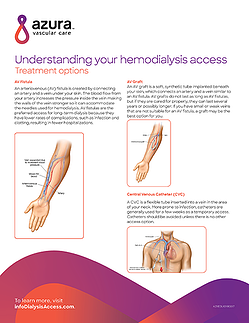 Start with this download and accelerate your knowledge of dialysis access and how to protect your own.